Louvered exterior shutters add a timeless detail to home architecture. At Hooks and Lattice, we have assembled louvered shutters in various outdoor materials and in diverse price points to suit a range of customers, homes and design projects. Find affordable louver shutters in vinyl, traditional cedar shutters, fiberglass and composite options below. The beauty of louver shutters lies in their universal appeal. Whether a home is rural or urban, traditional or contemporary, louvered exterior shutters are a clever choice to enhance windows. In addition to various standard designs and sizes we manufacture and supply, custom louvered shutters may also be created to accommodate windows with unique dimensions. By default, shutters are sold for decorative-only mounting and all slats are fixed. For louvered shutters that swing, functional shutter hardware and hinges may be sold separately for specific designs. Shutter pairs are easy to install along most any surface. A mainstay of outdoor window accents, louvered exterior shutters make a tasteful addition to any home. As louver shutters continue to evolve with contemporary architecture, more material options become available. 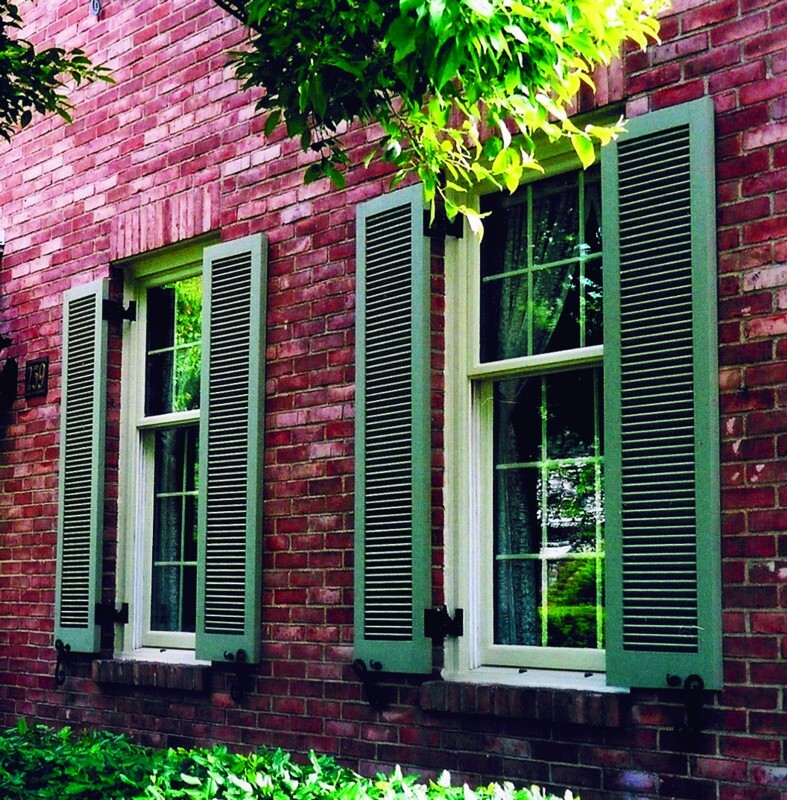 Currently Hooks and Lattice is proud to offer colonial window shutters in fiberglass, cedar, composite and vinyl - a material for every price point and preference. Exterior louvered shutters were once most common on Colonial homes of the Northeast and on the second level of homes in the South. Taking their cue from American tradition, the louvered window shutters featured above have horizontal slats. As a decorative product, all shutter style are given fixed slats and sold standard for stationary mounting. For swinging slatted or louvered shutters many of these products can be mounted with operable shutter hardware and hinges, available for separate purchase. Looking for low-cost black shutters that won't fade? At the lowest cost, maintenance-free vinyl exterior louvered shutters feature an attractive wood grain texture and durable temperament. These are available in 20 standard colors as well as primed and ready for paint. On the other end of the spectrum are the Atlantic Premium operable shutters. These funcational outdoor shutters are heavier duty and have all the beauty of wood, but without susceptibility to cracks, warping or rot. Louvered exterior shutters in both decorative and operable designs are a dream for enhancing curb appeal - fast, affordable and attractive. Mounting is easy and shutters add value to your home the moment they go up. Also, with carefree material options like composite, fiberglass and vinyl, homeowners have virtually no upkeep to worry about beyond periodic cosmetic cleansing. And for the traditionalists out there when it comes to materials, fixed louver wood shutters are of course available in lovely cedar - a wood known to hold up remarkably well outdoors - as well as solid mahogany, pine and redwood. Many of the louvered shutters for exterior windows come with easy mounting systems. While most designs are sold standard for fixed mounts, hardware to hang operable shutters is available for separate purchase. Depending on the material and design of louver shutters, different options may be available including center rails or mullions, panel addition and custom stile dimensions. To discover more options, please click on categories above. For custom orders and questions Hooks and Lattice encourages your toll free call or email.